". @adidas, @Hyundai, @Kia, @McDonalds, @Budweiser, @CocaCola, @Visa support slavery and more, I do not #FIFASlavery http://hdtk.co/r5MNH"
Human Rights shouldn't have to be betrayed just so us football fans can simply watch football, people are dying, being put into slavery and all in the name of football. 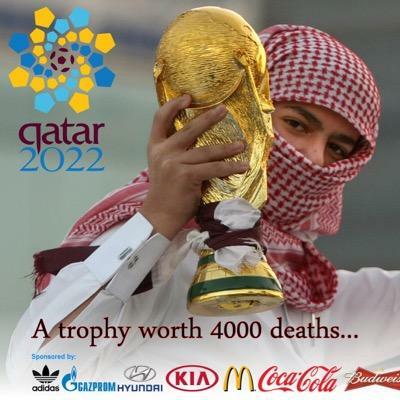 Adidas, Gazprom, Hyundai, Kia, McDonalds, Budweiser, Coca Cola and Visa are all sponsoring the World Cup therefore sponsoring the betrayal of Human Rights.